Jennifer Lawrence Is Vanity Fair & Marie Claire Thailand’s Cover Queen! – Pics! Jennifer Lawrence is quite a cover queen! In October and November 2014, Jennifer covers Vanity Fair and Marie Claire Thailand magazines. 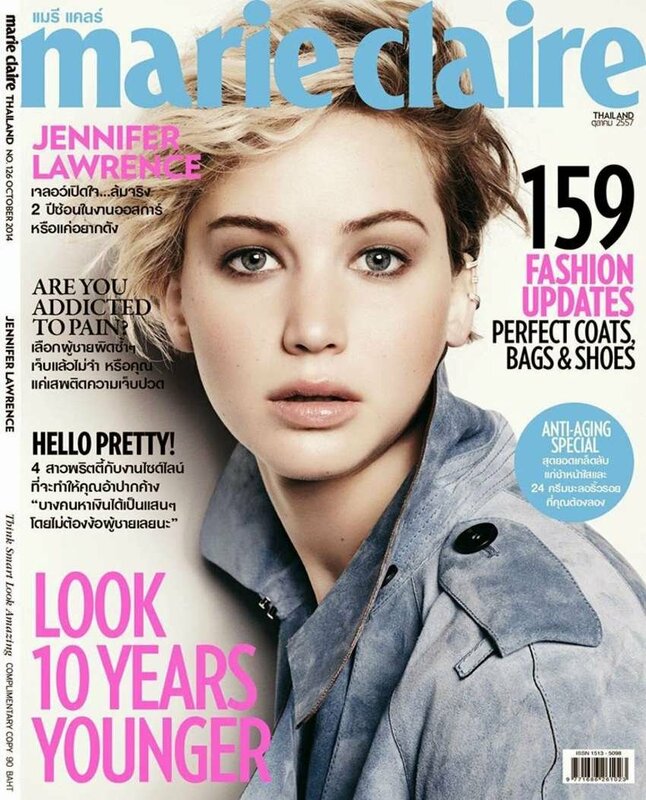 In Marie Claire Thailand Jennifer opts for a fresh, bright look in a blue jacket. In Vanity Fair Jen goes for a more mature look in multiple photos. Check out photos from both covers and shoots below! Benjamin Stockham Attends Vanity Fair NBC Party! About A Boy star Benjamin Stockham was in attendance at the Vanity Fair NBC party this past Tuesday, September 16th. While at the event Ben took some photos on the red carpet wearing clothing from La Miniatura. Actress Shailene Woodley has come out as a Smiler when she recently stood up for Miley Cyrus in a Vanity Fair interview. Do you agree with Shailene? We think Miley is just being Miley, and we love her for it! Leave your thoughts in the comment box below! Bella Thorne, Jaden & Willow Smith, Shailene Woodley, and more are all featured in Vanity Fair’s ‘Young Hollywood Rising Stars’ issue. Check out some of the shoot photos and behind the scenes videos below! Taylor Swift Sparkles Among The Stars At Last Night’s Oscar Parties — Check Out Our Giant Gallery! After wowing at the Weinstein Company’s Pre-Oscar shindig on Saturday, Taylor Swift couldn’t pass up the opportunity to party the night away at two separate Oscar parties for Hollywood’s big night (March 2) — Taylor arrived to the 22nd Annual Elton John AIDS Foundation’s Oscar Viewing Party in West Hollywood Park with actress and good friend Jaime King and the darling duo kept the fun rolling at the Vanity Fair Oscar Party later in the evening at Sunset Plaza! Taylor seriously sparkled in a gorgeous Julien Macdonald floor-length gown, the light catching the dress’s neck-to-toe sequins and the mesh paneling showing off her back when she turned around for the cameras, holding onto her reflective Emm Kuo clutch. Inside the parties, Taylor celebrated with everyone from host Elton John to pal Ed Sheeran to Gigi Hadid and Ireland Baldwin — along with all the big names the parties attract year after year, like Jennifer Lawrence! Cody & Gigi At Vanity Fair Oscar Party! Cody Simpson and Gigi Hadid looked stunning last night! They attended the Vanity Fair Oscar Party together. Check out the photo of the gorgeous couple above!